Modern, Stylish, Washable Velvet Plush Solid Furniture Protector. Make your living room a special spot by covering your furniture with the unsurpassed softness of velvet. Besides looking luxurious, our velvet plush solid furniture protectors guard your chair, sofa, loveseat, couch, or recliner against damage from spills, pet hair, or general grime. They're perfect for making old furniture look elegant again. Plus, you can toss them in the wash for an easy clean. - Velvet adds anultra-modern, tasteful, and luxurious look to any home. - Soft-to-the-touch comfortand durable polyester fabric make our slipcovers supple, light, and easy to maintain. We offer a 3-year "no questions asked" guarantee so you can buy with confidence. SAFEGUARD AND HIDE: This furniture protector shields and protects sofas, recliners, loveseats and chairs from pet hair, spills, stains, and grime. It can also hide existing wear and tear, making your old piece look vintage-style new. It's perfect for homes with children and pets! EASY CARE: Our polyester-blend velvet is deceptively simple to keep clean. Just toss it in the wash, and it comes out looking as classy as it did when it went in - no fading, bent fibers, or frayed edges. Cleaning the family room is extra easy with these furniture protectors. FITS MOST FURNITURE: Our furniture protectors are one-size-fits-most. 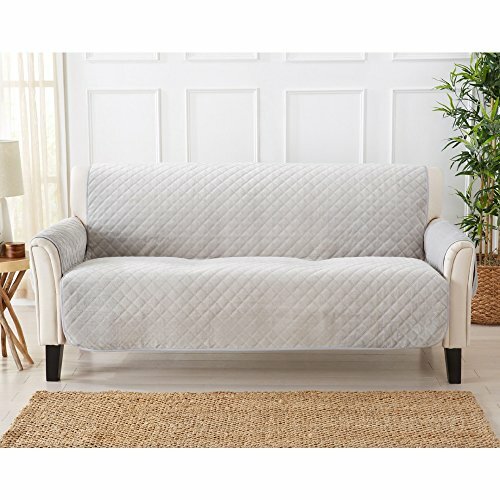 Our Sofa Furniture Protector fits most sofas 96 inches long arm to arm; our Loveseat Furniture Protector fits most loveseats 73 inches long arm to arm; our Chair Furniture Protector fits most armchairs 34 inches long arm to arm; and our Recliner Furniture Protector fits most Recliners 34 inches long arm to arm. Please see images for MEASURING GUIDE and please see product description below for more details on sizing. POSH LOOK, LONG-LASTING FABRIC: Nothing says luxury like velvet. Our plush velvet slipcovers feature a sumptuous, hip style that can cover stains, rips, or age spots on your furniture. Plus we use extra-durable velvet fabric to construct our covers, so you don't have to worry about them keeping their shape and color over time.